The rover's drill chewed easily through the rock, unlike some of the tougher targets it faced nearby on Vera Rubin Ridge. It was so soft, in fact, that the drill didn't need to use its percussive technique, which is helpful for snagging samples from harder rock. This was the mission's first sample obtained using only rotation of the drill bit. "Curiosity has been on the road for nearly seven years," said Curiosity Project Manager Jim Erickson of NASA's Jet Propulsion Laboratory in Pasadena, California. "Finally drilling at the clay-bearing unit is a major milestone in our journey up Mount Sharp." Scientists are eager to analyze the sample for traces of clay minerals because they usually form in water. NASA's Mars Reconnaissance Orbiter (MRO) spied a strong clay "signal" here long before Curiosity landed in 2012. 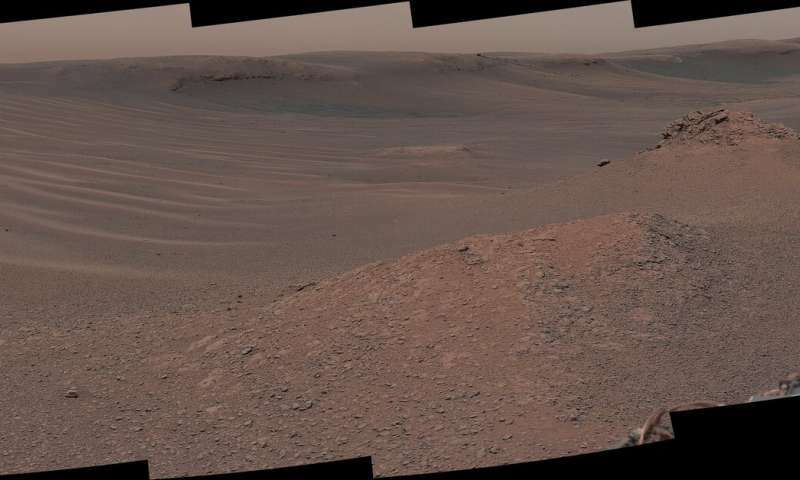 Pinpointing the source of that signal could help the science team understand if a wetter Martian era shaped this layer of Mount Sharp, the 3-mile-tall (5-kilometer-tall) mountain Curiosity has been climbing. The clay beacon seen from space brought the rover here, but the region clearly has several other stories to tell. Now that Curiosity is searching this area, scientists can peer around as geological tourists, finding a landscape both ancient and new. There are several kinds of bedrock and sand, including active sand ripples that have shifted in the past year. Pebbles are scattered everywhere - are they eroding from the local bedrock? Several eye-catching landmarks, such as "Knockfarril Hill," stick out as well. "Each layer of this mountain is a puzzle piece," said Curiosity Project Scientist Ashwin Vasavada of JPL. "They each hold clues to a different era in Martian history. We're excited to see what this first sample tells us about the ancient environment, especially about water." The rock softness promises mudstone (or possibly ash layers, let's hope not).